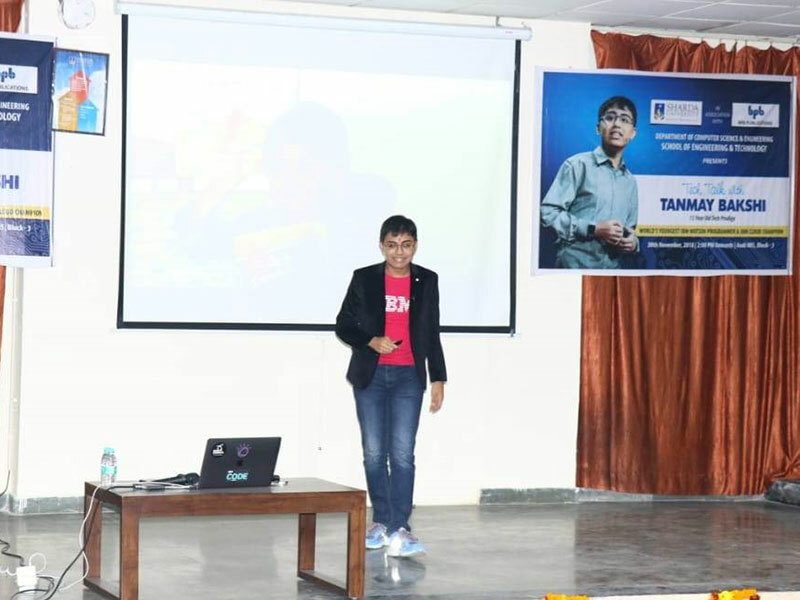 On December 1, Greater Noida based Sharda University, one of India’s leading UGC recognised university with students from more than 50 countries, hosted a ‘Tech Talk’ with 15 year old Tanmay Bakshi – world’s youngest IBM Watson programmer and an IBM Cloud champion. The event, which was organised by the School of Engineering & Technology, Department of Computer Science & Engineering, aimed motivating the students and enhancing their knowledge on new-age technologies. The Department of Computer Science & Engineering at Sharda University is envisioned to produce competent, creative and innovative computer professionals capable of meeting up the challenges of ever growing industry. With the support of experienced and highly qualifies faculty, the department aspires to play a lead role in the national vision of creating a futuristic knowledge economy through creativity and innovation in information and knowledge technologies. Some of the programmes offered by the Department of Computer Science & Engineering is B. Tech with specialisation in Data Science, IoT& Application, Artificial Intelligence, blockchain and machine learning. Tanmay is an author, AI Expert, TED keynote speaker, and a media personality who has already addressed over 200,000 executives, leaders, intellectuals, and developers worldwide at international conferences, schools and universities, financial institutions and multinationals. The United Nations, Linux Foundation, Apple, SAP, IBM, Walmart, Twilio, Internal Institute of Auditors, and HSBC are just some of the organisations he’s spoken at. His love for implementing AI architectures led him to build numerous applications in fields ranging from finance to cybersecurity, education to music and entertainment. His inclination towards implementing AI in the field of healthcare got him working on two of his main projects, which are very close to his heart – the first is focused on helping those with Rett Syndrome so they can “speak” through the detection and interpretation of EEG bio-signals. These EEG signals are analysed by cognitive systems. The second project focuses on suicide prevention through depression mitigation using Augmented Intelligence. Over 250 students participated in the interactive session led by Tanmay.